Q. If you’re not eating meat or dairy, where do you get your protein? A. 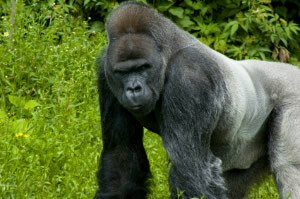 The same place a 400 pound gorilla gets his protein, from plant greens. To be completely honest, gorillas do eat some grubs and bugs that derive some protein from, but 95% still comes from the vegetation they eat. And depending how carefully you wash and look through your fruits and veggies you’re probably getting your fair share of little critters as well. It’s important to understand that we may not need as much protein as we’re told. The dairy and meat industries and their powerful lobby are responsible for the strong prevalence of those foods in the so called food pyramid. Dr T. Colin Campbell writes in his landmark book, the The China Study: The Most Comprehensive Study of Nutrition Ever Conducted And the Startling Implications for Diet, Weight Loss, And Long-term Health “The story of protein is part science, part culture and a good dose of mythology”. Depending on individual lifestyle needs a person may need only 25 -45 grams of protein a day or even less. Every day our bodies break down old cells and recycle many of the amino acids to build new cells and carry out bodily functions. Drs. Rick and Karin Dina, D.C. and nutrition educators, have shown that it is quite easy to fulfill daily protein requirements on a raw food diet. All raw foods, even fruits contain protein although greens, sprouts, nuts, and seeds will have the highest levels of protein. Like these animals, we too derive our proteins from the molecules that make up amino acids. These molecules are derived from the air we breathe, namely the nitrogen, ogygen, hydrogen, and carbon. Unless lung and liver functions are severely impaired, our ability to extract these molecules and synthesize them into amino acids/proteins is unlimited, for as long as we live. Apart from that, over 60% of all protein is being recycled. The high proteins are the good for the human body. Those who want high level of energy it is possible through the protein only. Those who engaged in the gym action like body building, it is essential to use the protein in the diet. This gives high octane energy level to the body. ****Hugh's response*** Actually research shows that high protein intake is damaging to the body. There are many elite athletes who consume very little to no added protein in their diets. Protein must be converted to simple sugar for fuel to create energy so eating carbs, perhaps in the form of fruit might be a much better idea. Of course we have to acknowledge that everyone is different and some respond better to higher protein intake within reason. Our article on Best Raw Vegan Proteins is published free of charge for everyone on our Raw Foodie Friends Group Page on Facebook. Just use this link: https://www.facebook.com/groups/155881414446083/doc/257278277639729/ and ask to join group.